Introduction Nonunions of diaphyseal forearm fractures are uncommon. They are usually associated with either a complex injury or a complication such as infection. As a result, the majorities of nonunions are atrophic and result in a defined bone defect. Bridge plates and bone grafts were used for the treatment of such cases; however, the presence of poor bone quality especially with disuse can decrease the screw purchase and stability of fixation. Combined intramedullary and extramedullary fixation may add to the stability of fixation and improve the rates of success. Aim The aim of this work was to assess the results of treatment of forearm nonunions with severe bone loss using combined intramedullary and extramedullary fixation with autologous iliac crest bone grafting. Patients and methods This study included six patients with forearm nonunions with severe bone loss treated by combined intramedullary and extramedullary fixation with autologous iliac crest bone grafting. The study included three males and three females. Their age ranged from 14 to 47 years (mean: 36.1±12.4 years). The duration of nonunion ranged from 6 to 180 ms (mean: 78±71.5 ms). A total of four (66.7%) cases had been infected previously. The number of previous surgical procedures ranged from 1 to 8 (mean: 3.5±2.5). The forearm was transformed into a single bone in three (50%) cases. Results All nonunions healed satisfactorily. The final pain scale ranged from 0 to 2 points (mean: 1.3±0.8 points). There was a slight limitation in activities of daily living in all points. The hand grip was normal in one patient, slightly weak in four patients, and moderately weak in one patient. Conclusion Combined intramedullary and extramedullary fixation with autogenous bone grafting is a reliable method of treatment of difficult forearm nonunions with significant bone loss. Treating forearm nonunions is a challenge for the orthopedic surgeon. Review of the literature of this subject shows that despite the use of various techniques, the results are not completely satisfying and there is still a debate on which technique to use . Plate augmentation is gaining increasing popularity in the treatment of diaphyseal nonunions of the femur, tibia, and humerus following intramedullary nailing. This combined fixation improves the stability of fixation and leads to high union rates . This study was carried out to assess the results of combined intramedullary and extramedullary fixation together with an autogenous iliac crest bone graft to treat nonunions of the forearm with severe bone loss. Those cases have poor bone quality resulting from disuse associated with prolonged immobilization. Plate fixation alone in such cases may not provide enough stability required for bone healing. To our knowledge, this is the first report to use the combined technique in the treatment of forearm nonunions. This study included six patients suffering from nonunion of the forearm with severe bone loss. The nonunion involved the radius and ulna in four (0.66%) patients, the radius with inferior radioulnar joint dislocation in one (16.7%) patient, and the ulna only in a patient (16.7%) who had a fracture of the ulna and a fracture of the radial head and the radial head was excised. A fully informed consent was taken from all of the patients. The treatment plan as well as the surgical procedure was checked and approved by the ethical committee of our institution and the international standards. There were three males and three females. Their age ranged from 14 to 47 years (mean: 36.1±12.4 years). The duration of nonunion ranged from 6 to 180 months (mean: 78±71.5 months). The number of previous surgical procedures ranged from 1 to 8 months (mean: 3.5±2.5 months). The initial treatment was double plating in five (83.3%) cases, and radial head excision with above-the-elbow plaster cast for an ulna fracture in one (16.7%) patient. The preoperative visual analog scale for pain ranged from 4 to 6 (mean: 5.16±0.75). Four (66.7%) cases had been infected previously. Those patients were treated at El Hadara University Hospital, Alexandria, during the period from January 2008 to January 2012. All procedures were performed with the patient under general anesthesia on a routine operating table in the supine position, and the arm resting on an arm support, with an arm tourniquet inflated. Henry’s approach was used to expose the radius in all cases. For the ulna, the direct posterior approach was used. The loose implants were removed when present. The bone ends were freshened removing dense and avascular bone and fibrous tissues until exposure of healthy bones. In all cases, the medullary canal was opened using a drill bit to ensure bone bleeding. Alignment was restored under vision and fluoroscopy control and thick intramedullary wires were inserted to maintain alignment. The bones were then distracted back to length and 3.5 mm dynamic compression plates were applied to maintain the length. In one case, a 4 cm long corticocancellous graft was taken from the iliac crest to fill the bone defect and the intramedullary wire was inserted through the proximal fragment, the graft, and the distal fragment. In three (50%) cases, the forearm was reconstructed as a single bone and the proximal ulna was fixed to the distal radius using the combined technique. The wounds were closed in layers over a suction tube. An above-the-elbow plaster cast was applied in all cases. Intravenous antibiotics were administered for 48 h postoperatively. A window in cast was used for wound dressing and removal of the stitches. The patients were seen every week in the outpatient clinic until the stitches were removed at 3 weeks postoperatively. The cast was removed 6 weeks postoperatively, and the patients were encouraged to start active exercises. Radiographies were taken every month to assess bone union. The follow-up period ranged from 6 to 48 months (mean: 30±16.9 months). All nonunions healed [Figure 1],[Figure 2],[Figure 3],[Figure 4],[Figure 5],[Figure 6]. There were no intraoperative or postoperative complications and no early or late infection. At the last follow-up, the mean visual analog scale for pain ranged from 0 to 2 points (mean: 1.3±0.8 points). Forearm functional results according to the Faldini modification of the Anderson scale  were as follows: elbow flexion and extension: loss less than 10° in one (16.7%) patient, loss less than 20° in two (33.3%) patients, and loss greater than 30° in three (50%) patients. Figure 1 (a) Preoperative clinical appearance with 90° flexion deformity at the nonunion site. (b) Preoperative radiographs showing nonunion with marked atrophy of the distal fragment of the ulna. (c) Postoperative radiographs showing single bone forearm with combined fixation and iliac crest graft. (d) Final clinical appearance and function. (e) Final follow-up radiograph. Figure 2 (a) Preoperative radiographs showing nonunion with severe bone loss. (b) Final radiographs showing union of both fractures. 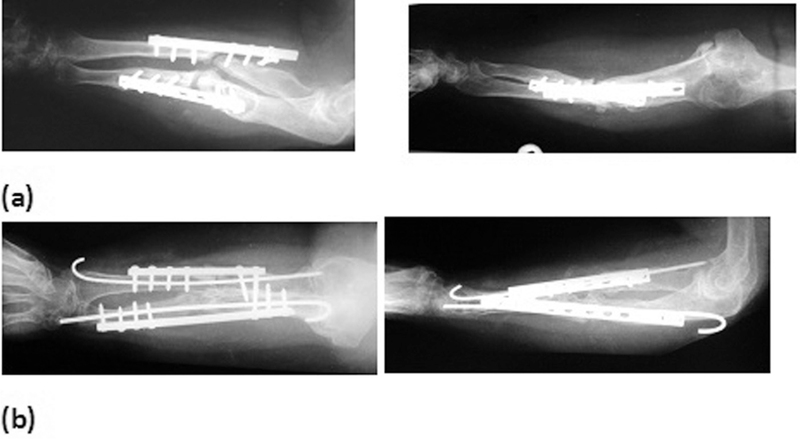 Figure 3 (a) Preoperative radiographs showing failed fixation of the radius and absent distal segment of the ulna. (b) Final radiographs showing full union of a single bone forearm. Figure 4 (a) Preoperative radiographs showing significant bone loss in the radius, radial shortening, and inferior radioulnar joint dislocation. 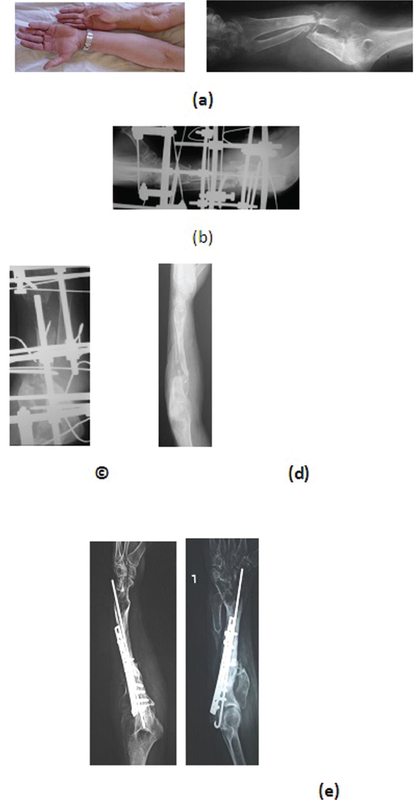 (b) Postoperative radiographs showing interposition of 4 cm corticocancellous graft to restore the radial length. (c) Final radiographs showing bony union. Figure 5 (a) Preoperative radiographs showing bone loss in the ulna with a previously excised radial head. (b) Final radiographs showing union and incorporation of the graft. Figure 6 (a) Forearm nonunion with marked shortening and bone loss. 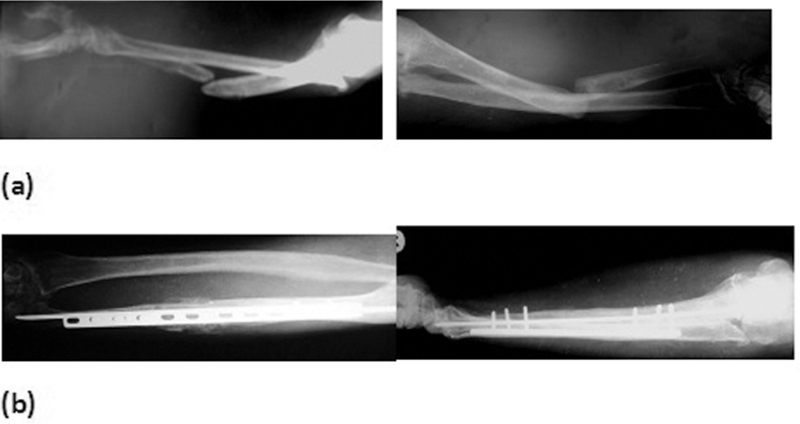 (b) Postoperative photograph showing conversion of the forearm into a single bone together with intramedullary fixation, Ilizarov fixation, and distal corticotomy for lengthening. (c) Photograph showing distraction. (d) Union of the regenerate and nonunion of the single bone forearm. (e) Final photographs showing union after combined fixation and bone grafting. Forearm pronation and supination: normal or loss less than 25% in none of the patients, loss less than 50% in two (33.3%) patients, and loss greater than 50% in four (66.7%) patients. Pronation and supination were lost in the three cases treated as a single bone forearm. One patient had reconstruction of both the radius and the ulna, and she had 60° of supination and 20° of pronation in the last follow-up. One patient had 30° of supination and 50° of pronation after reconstruction of the radial nonunion. One patient had 30° supination and 20° pronation following reconstruction of ulnar nonunion. Wrist flexion and extension: loss less than 10° in one (16.7%) patient, loss less than 20° in two (33.3%) patients, and a loss less than 50% in one (16.7%) patient, and loss greater than 50% in two (33.3%) patients. All patients resumed activities of daily life with slight limitation. The hand grip was normal in one (16.7%) patient, slightly weak in four (66.6%) patients, and moderately weak in one (16.7%) patient. Forearm nonunions are uncommon, but severely disabling and challenging to treat . Treatment of forearm diaphyseal nonunions differs from that of other types of diaphyseal nonunions because of the intimate relationship between the radius, and ulna and their reciprocal movements . The aims of surgical treatment are to regain proper length, and relationship between forearm bones, and recover function in terms of flexion–extension of the elbow, and wrist, supination, and pronation of the forearm, and hand grip strength . Treatment of forearm nonunions is a debated topic. Many surgical techniques have been described. Spira used an iliac graft fixed with an intramedullary nail, and reported a success rate of 73% . Hong et al. used interlocking nails and an iliac bone graft to treat 15 patients with forearm nonunions. They achieved 13% excellent results, 40% satisfactory results, 40% unsatisfactory results, and 7% failures . Grace and Eversmann  used an iliac bone graft fixed with plates and reported a success rate of 67%. Shelton and Sage  achieved a union rate of 87% using an iliac graft and compression plate. Faldini et al. in 2009 reported the use of a fibular cortical autograft strut with a plate and a fibular intercalary autograft in case of a segmental bone defect. They achieved union in all 20 cases . Faldini et al. , in 2011, reported the use of a homologous bone graft in combination with a plate in 14 patients with aseptic forearm nonunion. Union was achieved in all patients . Gupta and Kumar  used a tricorticocancellous bone block graft under compression with intramedullary nail fixation in 23 cases of forearm nonunion with a gap 1.5–7 cm. They achieved union in 36 out of 38 forearm bones . Prasarn et al. treated nine patients with infected forearm nonunions by aggressive debridement, followed by definitive fixation after 7–14 days using a tricortical iliac crest graft and leaving the wounds open to heal by secondary intention. All cases united and resolved their infection . Orzechowski et al. used Ilizarov distraction compression osteogenesis to treat six patients with forearm nonunion. Union was achieved in all patients . Safoury  used a free vascularized fibular graft for the treatment of 18 patients with infected nonunion of the forearm to restore radial, but not ulnar continuity. All fractures united with good soft tissue healing and resolution of infection . Dell and Sheppard  used vascularized fibula fixed to the ulna proximally and the radius distally in four patients with infected forearm nonunion with internal fixation. In addition, an external fixator was used in three out of the four cases. All cases healed . Review of all the previous results shows that the published results for the treatment of nonunions using conventional techniques (plating or intramedullary nailing) were not completely satisfactory. Hong et al. concluded that interlocking intramedullary nailing should not be considered an adequate alternative to plate fixation of these nonunions. Plate fixation alone may not provide stable fixation to allow for union following forearm nonunions, especially in cases associated with bone loss, prolonged immobilization, and disuse osteoporosis. Excellent results were achieved by Faldini and colleagues using a fibular cortical autograft  or a homologous graft  in combination with plate fixation. Faldini and colleagues attributed their 100% union rate to the fact that the addition of a cortical graft opposite a metal plate provides more stability compared with a metal plate alone ,. Despite the fact that the use of a fibular autograft can lead to donor-site morbidity, and a long scar in the leg, Faldini et al. reported that none of their patients had any limitation in their daily life activities attributable to the donor-site. However, Faldini et al. themselves used a homologous graft instead of the fibula and reported their results in 2011. The homologous grafts need the availability of tissue and bone bank in the same hospital . Excellent results were also achieved using Ilizarov distraction compression osteogenesis. The Ilizarov fixator provides enough stability. However, this technique requires more surgical time and co-operative patients because of the difficult postoperative management . The combined technique described in this study can increase the stability provided by plate fixation using an intramedullary pin. The idea of plate augmentation is gaining increasing popularity in the treatment of diaphyseal nonunions of the femur, tibia, and humerus following intramedullary nailing ,. In this study, we used intramedullary pins to improve the stability provided by plate fixation. Although plates are strong under torsional forces, they are weak under bending forces because of stress concentration through the screw holes. Intramedullary nails are strong against bending forces and are weak against torsional forces . Park and Kim  found that plate augmentation after interlocking intramedullary nailing was significantly stiffer than the intramedullary nail alone in the 5 mm bending test. The torsional stiffness showed that the plate augmentation group was 3.3 times stiffer than the interlocking nail-only group. They believe that the retained nail acts as a load-sharing device, neutralizing the shear forces on the fracture site, and maintaining alignment of the fracture . We believe that the combined technique can increase the stability provided by plate fixation significantly, especially in forearm bones following nonunions with bone loss and disuse osteoporosis. This may explain the 100% union rate in this study. This union rate may also be related to the use of an autogenous iliac crest cancellous or corticocancellous graft. This graft has more osteogenic potential than cortical fibular nonvascularized grafts.In fact, the choice of bone graft is an ongoing topic of debate. Kloen et al. believe that for defects up to 6 cm, autogenous cancellous bone graft is the graft of choice. Vascularization of corticocancellous grafts occurs within a few weeks if the soft tissue envelope is compliant and well vascularized . In more complex cases of substantial defects with concomitant poor vascularized soft tissues, the use of an osseocutaneous free flap is a viable alternative. It can create a suitable soft tissue environment in addition to bony continuity . Dell and Sheppard  recommended that this technique should be considered for infected nonunions that are unresponsive to properly administered conventional surgical and antibiotic treatment. Kloen et al. do not advise a free fibular graft despite its high success rate because of their disadvantages including donor-site morbidity, the need for microsurgical expertise, and a high risk of infection. In this study, the forearm was reconstructed as a single bone in three (50%) cases. In fact, two cases were converted to a single bone during previous operations, but they failed to unite. One failed to unite after plate fixation ([Figure 3]), and the second after an intramedullary pin and an Ilizarov external fixator ([Figure 6]). The third case had marked thinning and atrophy of a long segment of the ulna following infected double plating ([Figure 1]). This technique stops forearm movements in pronation and supination. However, this can be the only option for reconstruction in such cases. This technique is also used by microsurgeons to reconstruct large defects. Dell and Sheppard  used a vascularized fibula to connect the proximal ulna to the distal radius. Safoury  used a vascularized fibula to reconstruct radial, but not ulnar continuity. To conclude, the combined technique together with an iliac crest graft can improve the stability of fixation in forearm nonunions with severe bone loss and disuse osteoporosis and also provide osteogenic potential enough for healing of such difficult nonunions. The main limitation of this study is the small number of cases. However, those cases are uncommon nowadays. In addition, publishing our results may encourage other authors to use the same technique so that a multicenter study may be carried out to assess the results on a larger scale. Combined intramedullary and extramedullary fixation with autogenous bone grafting is a reliable method for the treatment of difficult forearm nonunions with significant bone loss. Faldini C, Pagkrati S, Nanni M, Menachem S, Giannini S. Aseptic forearm nonunions treated by plate and opposite fibular autograft strut. Clin Orthop Relat Res 2009; 467:2125–2134. Lee KH, Kim HM, Moon CW, Kim YS, Nam WS. Augmentation plate fixation for the management of long-bone nonunion after intramedullary nailing. J Korean Fract Soc 2004; 17:265–270. Kloen P, Buijze G, Ring D. Management of forearm nonunions: current concepts. Strategies Trauma Limb Reconstr 2012; 7:1–11. Spira E. Bridging bone defects in the forearm with iliac graft combined with intramedullary nailing. J Bone Joint Surg 1981; 63-A:226–231. Hong G, Cong-Feng L, Hui-Peng S, Cun-Yi F, Bing-Fang Z. 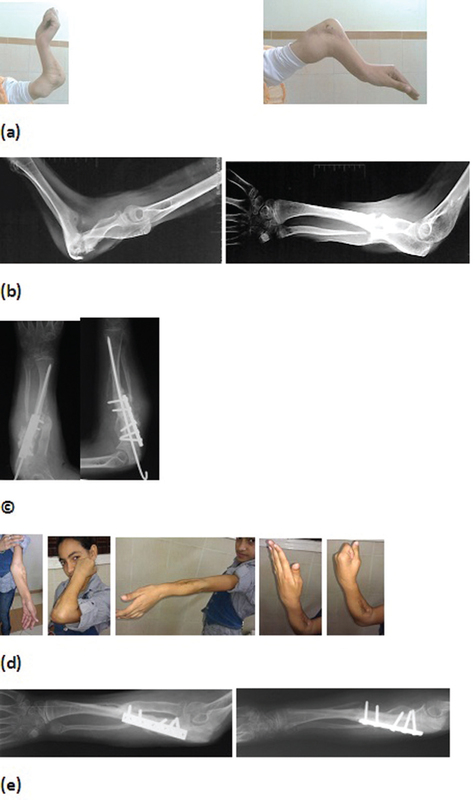 Treatment of diaphyseal forearm nonunions with interlocking intramedullary nails. Clin Orthop Relat Res 2006; 450:186–192. Grace T, Eversmann W. The management of segmental bone loss associated with forearm fractures. J Bone Joint Surg Am 1980; 62:1150–1155. Shelton W, Sage P. Modified Nicoll graft treatment of gap non union in the upper extremity. J Bone Joint Surg Am 1981; 63:642–646. Faldini C, Miscione T, Acri F, Chehrassan M, Bonomo M, Giannini S. Use of homologous bone graft in the treatment of aseptic forearm. Musculoskelet Surg 2011; 95:31–35. Gupta D, Kumar G. Gap nonunion of forearm bones treated by modified Nicoll’s technique. Indian J Orthop 2010; 44:84–88. Prasarn M, Ouellette E, Miller D. Infected nonunions of diaphyseal fractures of the forearm. Arch Orthop Trauma Surg 2010; 130:867–873. Orzechowski W, Morasiewicz L, Dragan S, Krawczyk A, Kulej M, Mazur T. Treatment of non-union of forearm bones using distraction-compression osteogenesis. Ortop Traumatol Rehabil 2007; 4:357–365. Safoury Y. Free vascularized fibula for the treatment of traumatic bone defects. J Hand Surg Br 2005; 30:67–72. 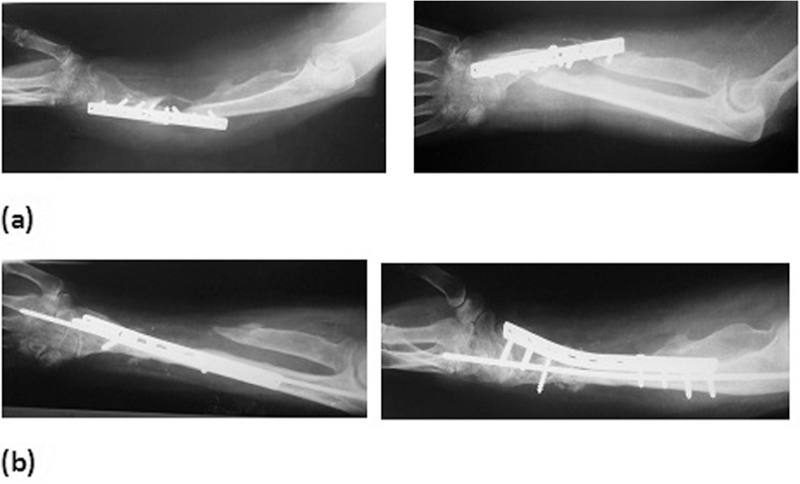 Dell P, Sheppard J. Vascularized bone grafts in the treatment of infected forearm nonunion. J Hand Surg Am 1984; 9:653–658. Park K, Kim K. Comparison of mechanical rigidity between plate augmentation leaving the nail in situ and interlocking nail using cadaveric fracture model of the femur. Int Orthop 2011; 35:581–585. Said G, Said H, El Sharkawi M. Failed intramedullary nailing of femur: open reduction and plate augmentation with the nail in situ. Int Orthop 2011; 35:1089–1092. Tarr R, Wiss D. The mechanics and biology of intramedullary fracture fixation. Clin Orthop 1986; 212:10–17.